Oh my goodness, it was such a full Saturday and then today I just crashed. Well, not really Dustin was tired and I seriously just fed off the lack of energy. And now I feel really sick. Who knows what's going on? Anyhow, here's a reject for the last Paper Crafts call. Dustin is trying to tell me that less is more. So, I figured I'd give it a try. I'm not thrilled with this but it's clean right? The stamp set is The Paper Company Studio, Jeepers Creepers again. I'm not sure if you can tell but the middle owl is popped. Alright, I'm hoping the mojo kicks in this week. Hopefully, I'll have new and cute stuff to show. Have a great week friends! Love those little owls! They are super cute! darling!!!! and you sound like me. no clue what it is, but feel like death warmed over. it'll get better. it has to. Hope you feel better! Rest! 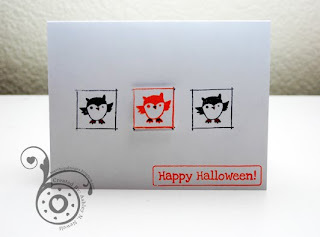 I think this is cute – love the white when you see so many Halloween cards really dark. I can’t do the less is more thing, but I like seeing others do it.